During the December festival of Saturnalia, Romans threw their social norms out the window. Not only did everyone party, eat, drink and gamble but they also switched roles. The masters served banquets to their slaves and slaves were allowed to disrespect their masters. According to Wikipedia, Roman citizens (a privileged political and legal status) normally went about bare-headed, but for Saturnalia they wore the pileus, the conical felt cap that was the mark of a former slave (freedman). Slaves were not ordinarily entitled to wear the pileus but they wore it during Saturnalia, too. Everyone was pileated. I just love this bird. When I lived in a more rural area in Conway & when I was many many years younger when I actually hung clothes out on a clothes line the first time I met one was when he swooped over my head to try to steal a wooden clothes pin. Then I always saw him most everyday. 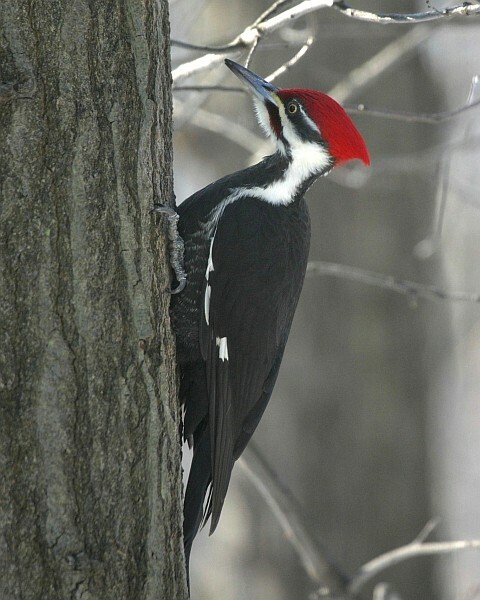 We have one here in Bridgeville, altho it is not pileated kind. It is still a red headed woodpecker & prior to the last painting of our building, which is wood he had made a nest inside somewhere & because he was endangered also we could not close up the hole until the last kid had done flew the coop!!! Now he still comes to my feeder and it interesting to watch. But that bigger one is surely a charmer for me.